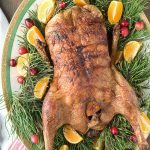 This simple duck recipe is flavorful and a wonderful way to change up the entree for a special meal. Preheat the oven to 375 degrees F. Equip a 13 by 9-inch roasting pan with a roasting rack. Combine the salt, pepper and Chinese five spice in a small bowl; mix together. Remove the neck and organs and rinse the duck inside and out and pat is dry with paper towels. Trim any excess fat at the neck and cavity*. If the tail is still present, remove it by cutting it at the joint next to the duck body. With a sharp paring knife or a bamboo skewer, pierce the skin of the duck avoiding the meat, in 1-inch spacing. This allows the rendered fat to more easily drain. Rub the salt-pepper-spice mixture into the duck outside and inside the cavity. Fill the cavity with the orange, shallot and rosemary. Place the duck breast down on the rack and insert into the heated oven for 30 minutes. Pour off rendered fat or using a bulb baster, remove as much as possible from the pan (this will help keep the smoke levels down during cooking), or remove duck and pour it out of the pan. Turn the duck over to be breast side up and cook an additional 90 minutes. The skin should be a deep brownish-gold and when the drumstick is pieced the juices should run clear. Remove from the oven, tent with foil and allow the duck to rest for 10 minutes before serving. *Note: This is purely for aesthetics but I trim the skin at the neck leaving a small flap to fold over the exposed bone and secure it with a toothpick to the duck skin on the other side. I do the same with the skin around the cavity (refer to photos); trimming the skin, folding the skin over the cavity and use a toothpick to secure the skin flaps to each other.